It may sound crazy but there is always space for potting up potatoes. Whether you are in an apartment or condo, little house or big house. Here are a few tips that may convenience you to give this a go. 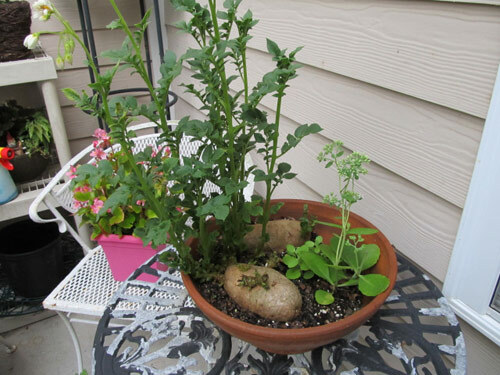 A potted potato needs a soil depth of 2 feet to grow in so when selecting your garden planter keep this in mind. Also, potatoes will rot if left to sit in wet soil so you must have good drainage. If you don't have enough drainage try to drill more no matter what type of planter you use. You can drill around the sides also about 1" from the bottom to ensure the water is draining completely. Place the container you chose in a sunny spot before starting to plant. Fill the planter with potting mix up to 5" from the top. Not any deeper or it won't get enough sunlight and not higher or there won't be enough soil to cover it. Press your potato about 6" into the potting mix with the potato eyes facing up. 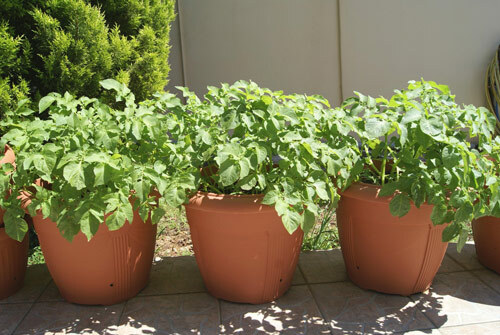 Start with only one or two potato per pot or the soil will be sapped of nutrients too quickly. Cover the potato with soil. 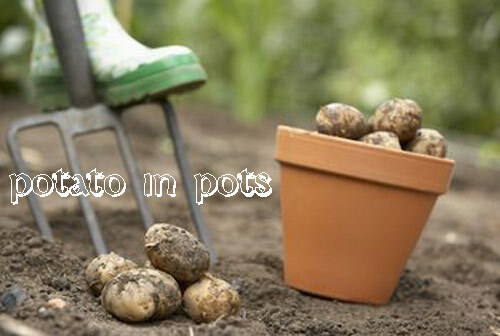 Keep soil moist but avoid over watering, which will cause them to rot in the pot and produce watery potatoes. Water once a week except in extreme heat. Then water more often. 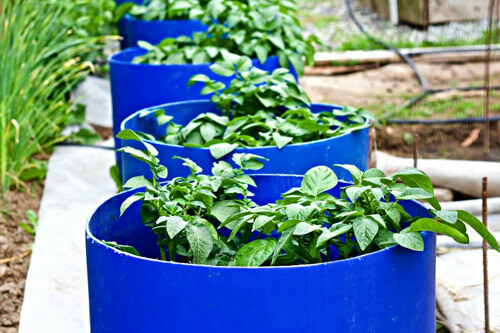 After the plant grows a few inches tall, apply a fertilizer but don't over fertilize for you will produce fewer tubers. Harvest the baby potatoes from the container when you want. Once the flowers are gone the plants energy is invested in growing the tubers. As the plant yellows dig up a few tubers and see what you think. If you wait till the plant dies back you will get the mature tubers. Once you harvest all the potatoes dispose of the potting mix and expired plants. All soil nutrients are gone and may container disease. Wash the potted potatoes and allow to dry. Store properly.